Next thing you know, your intonation is shot and you break a string while wiping off the accumulation of six months of rust and dead skin cells. Just the other day I changed the strings on my mandolin. I was anticipating the first lesson with a new student and decided it was time, since for the past year I'd only had guitar, bass, and ukulele students. I knew better, but still had been holding out for whatever the reason was. Sure, I saved a little time, money, and effort by not changing them. But once my instrument was restrung and tuned up, I realized I had only ever been sacrificing tuning stability and most importantly tone! With these new strings ready to go, I heard a brightness and crispness out of my instrument I hadn’t experienced in a long time. It not only sounded better, but it made playing much more fun. It’s like putting air in your tires or getting a fresh oil change in your vehicle. Everything just functions much smoother and you realize the full capability of not only your instrument, but also of yourself as a musician. People buy strings like they buy items at the grocery store. After a couple of tries you found a name you trust that pumps out a consistent quality of product, so you keep on buying it. It’s worked out fine in the past, so why change now? We are here today to help you break free. It's time to understand the difference between the types of guitar strings. We can have higher value from our brand of choice or any other by understanding which product serves our personal preferences and instruments the best. Let’s dive in and learn about the many variables that makes certain strings better or worse for each individual player. 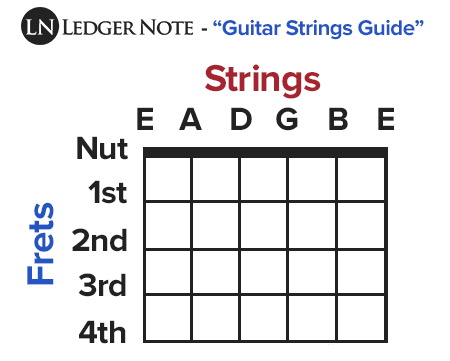 Everyone who first takes a serious interest in guitar wants to know what the string order is in terms of musical notes and why they're arranged in that fashion. It's a great question. The reason for their order boils down to the evolution of the stringed instrument. By adding a string or two, shortening the neck, and arranging them in a Perfect 4th Interval you can increase the speed of playing and reduce strain on the hands and wrists. Other interval layouts were toyed with but had some harmonic problems that couldn't be ignored. You can even make up your own! Who knew guitar was so much fun... This is your standard tuning. There are alternate tunings but that's for later once you master this one. When people ask "What are the guitar string sizes?" they really want to know about the gauges, the term referring to the diameter of the string. The answer is... that's not quite how it works. Yes there are standard gauges but in several standard sizes like light, medium, and heavy. Each, when properly tuned, will exert a different tension on the guitar's neck and if you jump to another size you'll probably need to adjust the truss rod and get used to the new action of the fingerboard. Choosing guitar strings is like choosing lenses and frames for your glasses. There is a right strength of lens for you and when you switch frames it may take some adjusting to get used to. This analogy is referring to the bridge height, nuts, and truss rod tension. Do take your time to experiment but once you settle it's best to keep using the same gauges so you can dodge the lengthy set-up process from happening again. Sometimes you'll see the set of strings designated by the gauge of the high E string (the thinnest). So a Heavy set might be called an 0.12 set. Heads up on that. On the other side of that coin, take a look at Stevie Ray Vaughan. This madman squeezed an impossible to mimic tone out of “Thirteen's!” This is the guy who ripped off a guitar callus and super glued it back on to finish out a concert. Stevie Ray Vaughn sweats bullets with a grimace on his face while B.B. King is chilling to the max. So what do these eight and thirteen numbers even mean? Guitar string size, or gauge, is measured in thousandths of an inch. That’s 1/1000th of an inch, y'all. That’s how small of a target we swing at with our picks and fingers. Baseball batters have it easy. Nowadays, you can find many in-between sets, but you'll want to have a solid understanding of what the gauges are in terms of actual measurement and how they affect your ability to perform with your desired tone. These relatively open descriptions will also differ from acoustic strings to electric strings, so your experience in handling many types of guitar strings and gauges is paramount in making the right choice. The size of your strings affects your playability, depending on the genre you're working within. If you are a Blues player who is going to bend strings constantly, you may prefer a lighter gauge of string to offset your workload. If you are a Jazz player who will never bend more than a quarter step, you can afford to play thick, flat, wound strings. There is a legitimate physical aspect to the gauge of your strings that will affect how well you play. Bending and fretting becomes much easier and faster with a lighter set, but in my own experience you will have a “tinnier” tone that must be compensated for with your guitar and amp tone controls. Speaking of tone, lets look at how string gauge affects the sound you produce. Tone is often described using analogies. If thinner strings cause a “tinny” tone, then thicker strings provide a “meatier” sound in the EQ spectrum. Certain aspects of this thicker sound can only be achieved by using a bigger gauge of string. Pat Martino, Stevie Ray Vaughan, and other guitar masters are a testament to this philosophy. A bigger string will offer a bigger sound, if we are willing to make sacrifices in other areas. Again, these sacrifices may be negligible depending on your genre. This sounds great, but other tone masters use the lightest of string gauges to full effect, too. The honest truth lies with the listener’s ear and capability to identify a sound with an individual player. B.B. King was known for his tone and only later revealed his secret mentioned above. It wasn’t even really a secret; it was more of a physical shortcut that allowed him to express himself. You should choose what feels and sounds best for your own musical expression. His tone is incredible and he is capable of an extreme vibrato that is perfect for his style of playing. It’s obvious he’s not working hard for it. His choices of strings benefit his economy of motion. Even though he maintains low action on his Fender Stratocasters and even scallops the frets for acrobatic, tight-rope string walking, his ability is only strengthened by the ease of playing light string gauges. Whether you decide to play heavy strings because it fits your style and tone preference, or you choose to rock out on light gauge strings to make bending and playing easier in general, there are many options and brands available in today’s modern guitar string market. They may appear the same on the surface but their construction matters as well. Let’s have a look at how the core material of a string can affect factors of playability next. The core metal used for strings is an important variable to consider. Not only does the string core affect tone, but it affects the tension strength as well. The heavier the string gauge, the stronger the core metal needed. You don’t want premature string breakage, especially during a gig. Your options absolutely depend on the tone you desire, but they also depend on the string gauge you prefer for the genre of music you play. How do these options affect our choices? Choosing guitar strings may seem pretty complex at this point but it's not that bad. We'll keep it as simple as possible. Just choose if you're stringing up an electric guitar or acoustic guitar and then read about those specific picks and the right answer will pop out at you. I'd like to point out that there are different core shapes. Pictured above is a hex core which isn't very popular compared to round cores. You'll likely only encounter round cores unless you seek out the hex shape. You might enjoy trying it, you never know. Stainless Steel is a great choice for any player. They have a balanced tone that allows the bright pick attack to come through while resisting the corrosion that can come from the player’s hand sweat. They tend to be less squeaky and last a long time, which is always a bonus to your wallet especially if you play quite a lot. Nickel Plated Steel is also tonally balanced and can easily achieve a warm tone while preserving the bright pick attack that can define your articulation. Nickel Plated Steel is one of the most common choices for all players and works well with all genres. Nickel strings are literally pure nickel metal. These strings were commonly used in the past and can impart that vintage sound that many players desire. They harken back to the older generation of players we all love and study. The other options, while available, are not as common in today’s arena, but are definitely worth a shot. Copper and Chrome are much softer materials, and may be prone to premature string breakage. Titanium is a very strong material that might provide value to players who don’t enjoy changing their strings as often. Of course, you can restring any time for any application. But you'll likely choose a favorite core type within each category. Phosphor Bronze is very common in today’s market. They are produced to prevent corrosion from sweat and reduce oxidization that produces rust on the surface. They tend to be in the middle range of brightness and hence produce an overall sound that is conducive to any genre or play style. 80/20 Bronze strings are a mixture of Bronze and Zinc. They are also referred to as Bronze/Brass strings and are extremely common, much like Phosphor Bronze. One of the main differences is this variety produces a very bright tone that enhances articulation and pick attack. This effect can be lost very quickly depending on how much the player sweats and how often they clean their strings. This choice can be a little more demanding on the wallet, due to having to change them more often. Silk strings and Steel strings are described as a mixture of classical and steel strings, and are also called “compound strings.” They have a mellow sound and lower tension that provide the feeling of a classical guitar, while still providing the brightness of the metal of a steel stringed acoustic. The term silk is referring to the nylon used to make classical guitar strings, which we will learn about next. Nylon strings are the standard for classical guitarists in today’s market. While there are many types of nylon strings, the most commonly seen is clear nylon. They are visually appealing while providing a clarity of tone with a bright attack that offsets the mellow overall tone of the classical guitar. Other options include black nylon, rectified nylon, and composite strings. The best classical guitars on the market come strung with nylons by default still. Gut strings were the original strings for the classical stylist. They were literally made from the guts of farm animals, mostly sheep. The intestines and the process used to make these strings became more expensive than nylon and thus have fallen out of favor. Even though you may hear the term “cat gut” strings, this style of string was never made from the innards of our cute, cuddly, feline friends… just the beasts we like tend to use as a food source. Silver Plated strings tend to refer to the bottom 3 strings of a set. These are the strings that are wound with metal to help provide the tensile strength and diameter to achieve the proper low notes of the guitar. They tend to be much warmer in tone than their counterpart, the gold plated strings. Gold Plated strings are really just 80/20 Bronze & Zinc wound nylon strings. They are also used to produce the bass wound strings of a set of classical strings. They maintain their place in the market due to having a much brighter tone than silver plated strings and are used by many professionals due to their capability to project louder and sharper. Most players today are familiar with coated strings, but this is truly a very recent development in guitar technology. Elixir Strings are the leader in coated strings for acoustic and electric. Coated strings have polymer webbing wrapped around the string that protects the metals from oxidation and skin oils, which enhances the life of the string tremendously. While this provides a longer lifespan and prevents the player from having to buy new sets of strings as often, they do cost more money for providing extra benefits. Any guitarist knows: The longer you play a set of strings, the less bright and new they sound. They will receive added mass from rust, oils, skin cells, and dirt. This will cause the string to loose brightness and affect the overall intonation of your instrument. Coated strings have found a way to bypass these effects for an extended period of time. Many players swear by this new technology and are willing to pay a higher premium for better tone for a longer period of time. Check out a set of Elixir strings for yourself to hear and feel the difference. The coating actually reduces string squeaks as well, providing a consistent sound for close miking and recording acoustic players. The squeak of the finger over the round wound strings of an acoustic has always been an intrinsic part of the instrument, but hearing the guitar performed without such extra squeaking may change your mind. Elixir now offers different varieties of their polymer coating on many different gauges and string cores for both acoustic and electric steel strings. Try them out, they could provide that extra functionality you’ve been looking for. The difference extends far past just the look and feel. Roundwound strings have a shorter life, create more string noise, and wear on your frets more, but feature a brighter tone, longer sustain, and lower tension. You'll also hear more harmonics and be able to grip them better for bending and finger picking. Flatwounds last longer and have a warmer sound... pretty much the opposite of what we listed for roundwound's. Is one better than the other? Depends on the player and the genre. We're not really talking about pro's and con's so much as preferences. You should be able to choose already based on questions like "Am I playing gritty rock and roll or smooth jazz?" You can click any of the links in the list above to visit each manufacturer's homepage and jump over to Amazon to do a price check. Don't Pinch Pennies - It will literally only be a difference of a couple of bucks to get the good stuff over the shoddy options. Go ahead and spring for the best strings you can. You'll enjoy yourself more, sound better, and learn faster. Buy in Bulk - Once you know what you like, when you buy a set of strings go ahead and pick up 3 to 5 sets. There's no point in reordering or running down to the store non-stop. You wouldn't do that with toilet paper or ear swabs, so don't do it with strings that are equally as inexpensive. Stock up! Don't Freak Out - If you're new you may be tempted to try every size in several brands. It's not needed nor will you have the time to set up your guitar that many times. First decide which guitar string thickness you prefer, then test the brands above. Popular is Popular for a Reason - The best strings rise to the top. Try out the main cores, main sizes, and main brands first. You'll likely settle somewhere in there and not need to test out obscure manufacturers and crazy options. There's no need to feel anxious about anything. Follow the crowd. This is one of those rare times they're right. You can extend the lifetime of your strings by wiping them down with a clean cloth after each play session. It only takes moments but will remove grime and residue. Guitar maintenance is the key, whether that's strings or any other part. Washing your hands before you play can reduce the amount of oils you're depositing in the strings and ultimately delay oxidation. When you change your strings, write the date down and toss it in your case. You'll be able to keep track and spot out the pattern so you can come to anticipate it in the future. Keep an extra set or two in your case. It's a good idea to keep extra high strings around, too. They're more likely to break on you or a bandmate and can save you in a live performance emergency. Lastly, you should invest in a cheap string winder. They're dirt cheap and will help you restring in a heart beat, which matters if you're in the middle of a song or on set break and scrambling to get ready to get back up there and melt faces. Beginners will want to know "how much do guitar strings cost?" often because they're young or already adult starving artists. The fortunate answer is that the price is low for all of us. You can buy some really crappy strings for $3 to $5 bucks a pack, or go to the respectable tier and spend around $8 to $10 per set, or get the best at $15 to $20 dollars tops. Now, if you're just getting started and breaking strings every time you try to tune up because you hit the wrong octave, then start out with the cheapest strings. Once you can reliably tune and play without destroying them, you can work you way up. Once you have the hand coordination, your learning will be accelerated too. The right tool for the right job, as Old Grandpappy always used to say. The best electric guitar available will be garbage with the worst strings on the market. Choose wisely! This string overview is useful for understanding what choice to make that suits your play style the best. As players, we are always searching for the highest possible functionality, while balancing tone and playability for the genre we play. Check out what brand and gauge your guitar heroes use to help you zero in on your perfect string set and keep on rocking! How to Build Guitar Calluses: Take Care of Your Fingers!